The King fern is easily mistaken for a trunkless Palm. It produces possibly the longest fern fronds in the world. 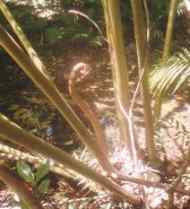 The fronds can grow up to 7m in length. It does not a have a well-developed trunk. The fronds sprout from near ground level. The King fern likes dimly-lit rainforest stream banks. The related potato fern (Marattia oreades) has weeping fronds up to 2m long. Like tree ferns both these giant ferns have an ancient history. Fossils well over 300 million years old, and very similar to the modern versions, have been found on most continents. The King Fern is also called the Giant Fern. 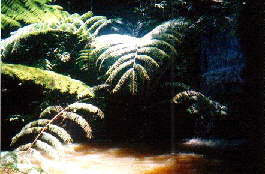 Excellent examples of the King Fern can be seen on the 1km Lake Eacham Waterfall Walk. Its rhizome is a massive trunk up to 1.5m tall, woody on the outside and deeply grooved, and quite fleshy within. It is black, very broad, and bears numerous crowns of fronds. Their stipes are erect, fleshy, green, smooth and swollen at the base. They may be up to 2m long. The base is covered by a pair of ear-like stipules that are dark with large white spots. The fronds of the King Fern, as can be imagined, are massive, over five metres long, arching and semi-weeping. The fronds are the largest in the world. Its spores are in dense clutters of five to eight opposite pairs. Each spore is round with a splitting along a central line. They become confluent with age as a brown powdery mass. Thick rope-like roots support the entire fern. The species is often damaged by feral pigs which gnaw through the roots. It is a versatile fern that can be found on a variety of situations, from dark shaded gullies to exposed rock crevices. The fern may be stunted and bleached in exposed situations, with broad fronds up to 30cm long and almost no trunk. In shaded wet areas it can be a huge fern. Old specimens have been found with trunks up to 2m across. The King Fern can be found in Queensland from sea level to about 600m, New South Wales (only the north-east where it is very rare however), Polynesia and Malaysia. It is excellent as a tub fern or can be easily grown in a protected position in the ground. Spores are short-lived and must be sown fresh. They are slow growing. Like its relative the Potato Fern (Marattia oreades), it is an ancient survivor from the Palaeozoic Era and has changed very little since even before the time of the dinosaurs. Fossils well over 300 million years old have been found on most continents. They are also found in Asia, where their huge size has resulted in them being known as 'elephant ferns'. It appears to be a very ancient, relatively unchanged genus, for Angiopteris fossils have been found that are several hundred million years old. Their enormous size means they have to live in very wet areas to retain turgor to keep their fronds erect. Thus this plant is very restricted in where it can live, which is usually only near waterfalls, along creeks and in gullies in well-developed rainforest.